The style of the Sartoria Capobianco is inspired by the ancient Neapolitan school, pure indication of freedom of expression. An elegance that adapts perfectly to the natural forms of the body. The jacket features soft and unstructured shoulders with “a camicia” (a similar technique that is used in shirt making) or “mappina” sleeves (small folds on the seam between the shoulders and the sleeve) and rounded patch-pockets that confer a touch of casualness to sportier attires. 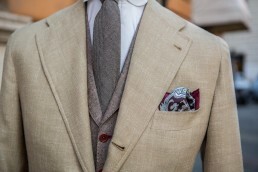 The formal suits require greater sobriety, but even in this case the lapels are generally broader with a wide, right-angle notch. The shoulders are natural and only slightly padded, which provides it a more flowing fit. The trousers, rather high at the waist, have a fuller front and forward pleats in order to reduce it optically without altering its comfort.